Fashion Culture Road Trip | Fashion a Way of Life! Fashion a Way of Life! Overalls are great part of the American history. They were around during our ancestors’ time and now have evolved into something that even our generation still wears. Overalls are garments that customarily feature both a pair of pants and a bib type of area that covers the stomach and the chest. In most cases, they include a buckle and a button closing attached to a strap that goes over both the left and right shoulders. Most overalls feature pockets, including a bib pocket at the chest and one at the side of each of the legs. The very first overalls, frequently known as slops, were created in the 1700s. They were mainly worn by the working man and were considered a symbol of the lower class. The old overalls were not made of denim, but instead were made of a tough cloth. They were built for durability not for comfort and they weren’t even fitted well, unlike modern day overalls. 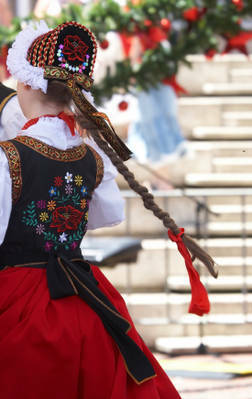 Traditional Polish folk costumes vary by region but on average are vibrantly colored and decked out with embroidery. 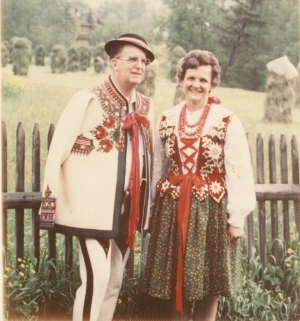 Poland’s folk costumes, at times, are still worn for special occasions, like weddings, or in the majority of rural areas of Poland by people of the elderly generations. 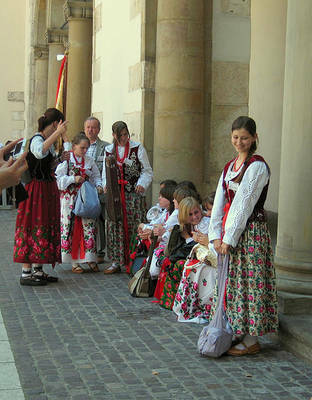 Traditional clothing in Poland differs by area depending on the resources available there, the climate, and by other cultures that the people came in contact with. German, Czech, Russian, Lithuanian, Romanian, and Austrian are just some of the cultures that have influenced the traditional dress of each region. In each area headdresses range from hats to wreathes of flowers, fabric colors diverge significantly, and aprons, vests, and ribbons are used depending on the origin of the attire. This girl’s folk costume includes a lace-up embroidered vest, white blouse, and full skirt. The hat of this attire is lined with braids and decorated with embroidery like the back of the vest. The woman also wears a long traditional braid. 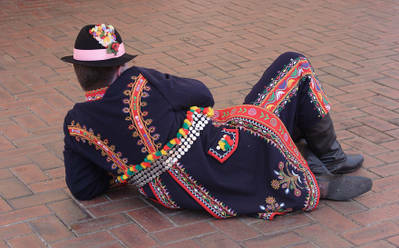 This man’s outfit is decorated with a variety of trims and embroidery. His long coat is paired with high leather boots and a hat topped with flowers. The flowered skirts of these costumes are worn with vests and blouses and sashes and beaded necklaces. This man’s jacket from the Mountain region of Poland is made from unbleached wool and has unique hand needlework. The matching trousers are also adorned with exquisite needlework and have a black stripe down each leg. The traditional shoes worn with this outfit are like moccasins, but have laces that are wrapped tightly over the bottom of the pants. The ladies’ vests are embroidered with silk and typically are embellished with sequence, tiny beads, or pearls. Ireland has no official national outfit, so “traditional Irish clothing” can be interpreted as anything from historical clothing to modern day step dancing costumes. During the Medieval and Renaissance periods, Irish were distinguished for short tunics. Men wore these tunics with woolen jackets, check trews (knee breeches), and mantels (a type of shaggy fringed cloak).Women wore long dresses (usually laced up the front) and headdresses made up of a roll of linen. Irish step dancing is currently associated with kilts and elaborately embroidered dresses, which people generally mistake for traditional clothing. This is not the case though these heavily embroidered dance dresses date back only to the 1990s. Many people believe that the kilt is part of historical Irish dress, especially because it’s worn a lot by male step dancers. According to Reconstructing History, the Irish kilt dates back to approximately 1900, when Irish Nationalist Padraic Pearse advised James O’Kelly to wear a kilt instead of trews. Kilts became popular in step-dancing in the 1930s and 1940s which could be the reason why people believe them to be traditional Irish clothing. Every time I see or hear about these “war scarfs,” as some refer to them, I think of the flawless city if Dubai. A keffiyeh is a head garment, traditionally worn by rural Arab males. It is a rectangular piece of cloth, folded diagonally and then draped over the head with aqal ring, the black cord looking thing, holding it in place. Traditional keffiyehs are black and white or red and white, but nowadays they come in every color of the rainbow. The keffiyeh was not born on the selves of Urban Outfitters though. For many decades, it was commonly used to protect against the cold of winter or the desert dust of summer. Trademark attire of the former Palestinian leader Yasser Arafat, the keffiyeh later came to represent Palestinian nationalism after the 1930s Arab revolt against the British Mandate and Zionist organizations in Palestine. It was this event that that first established the scarf as a symbol of resistance. It was worn in unity to make it difficult for the authorities to find the leaders of the rural-led uprising. However, the keffiyeh is not only Palestinian. Men in Jordan, Saudi Arabia, and the Arab Persian Gulf states wore keffiyehs in colors and styles that were specific to their region. For example, Jordanians wore a red and white keffiyeh, where as Palestinians wore a black and white one. And a man from Saudi Arabia would likely drape his keffiyeh differently than a man from Jordan. Now a days though, you are likely to see many, both men and women, locally and internationally wear theses “war scarfs” as neckwear in a variety of patterns and colors. Turbans are headgear made of cloth wrapped around the head. Turbans are worn, mainly by men, in many communities in Indian, Afghanistan, the Middle East, and in some areas if of Northern and Eastern Africa. Turbans worn in Pakistan and India are known as Dastaars, Pags, or Pagris. They are worn for a variety of reasons such as to show caste or status, cover facial and head hair, or even to help protect from the heat, wind, and sand. When I think of turbans, the first religion that comes to my mind is Sikhism. Sikhism originated in northern India and Pakistan in the 15th century and is one of the world’s latest monotheistic religions. Sikh men typically wear a peaked turban that partially helps to wrap their long hair. Faithful Sikhs both men and women, do not ever cut their hair because of the respect they have for God’s creation. Devoted Sikh men don’t cut their beards either. They comb their facial hair and then twist and tuck it up into their turbans with the hair from their heads. Native Americans are a huge part of our (the American) history. They clothes they wore are super intricate and Eco-friendly. Most Indian women wore leggings or skirts with tops, or dresses, varying in design, material, and length from tribe to tribe. Moccasins were worn by all Native Americans in some form or another. In the winter time they wore cloaks, leather and fur clothes, parkas (long hooded jackets made from animal skin), and mukluks (large boots). From tribe to tribe, headgear and ceremonial clothing varied the most. Native American’s ceremonial clothing usually included elaborate bead and Wampum (a type of shell) work and feathered headdresses. There were many different bead-work patterns that symbolized different tribes. Women were the main seamstress of the tribes. They prepared the animal skin and cloth that would be used to manufacture the clothing. Native Americans took clothe making seriously because they decorations and objects that adorned the clothing symbolized status, power, and occupations. They were also very resourceful with all the materials that were available to them; they never let anything go to waste. Eagle feathers, porcupine quills, and deer skin are just some of the things Native Americans used to make clothing. Whether it was leather for moccasins, fur, or quills and shells, the animals that gave their lives for the natives use were thought to be treated with respect, dignity, and care. African clothing was tremendously impacted in the 20th century when Africa began to trade with Western countries. In the beginning, mostly Europeans and Arabs influenced African clothing, especially in the northern regions of Africa. Today we still see the influence of Arabian culture in African clothing designs, embroideries, and long robes. Most modern African wear Western-styled pant suits, shirts, dresses, and shoes. Others combine the old with the new. They wear traditional clothing with Western styles. 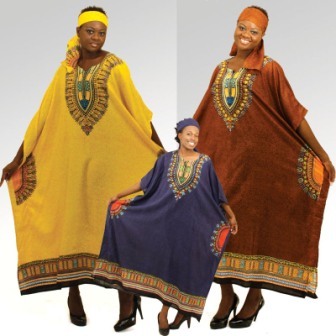 Kaftans, also referred to as boubous, are full-length embroidered robes are worn mainly by East African women today, but originally were only worn by West African men. Kaftans are made from cotton or silk and button down the front or are made to be slip on. Traditional Chinese clothing is broadly referred to as Hanfu. Pien-fu is a traditional two piece Chinese outfit that consists of a tunic and a skirt or pair of pants. This costume was mainly worn at ceremonial events by both men and women. The tunic was knee length and was worn on top of a skirt, which was ankle length, for women, or pants, for men. The Pien was a cylinder shaped hat that was typically worn to accessorize the outfit. The Changshan literally means “long shirt.” It is the male equivalent of the women’s Cheongsam. It is a long robe (one-piece garment with as shoulders to heel length. The Shen-i garment is a combination of the Pien-fu and the Chang-pao. The Shen-i has a tunic and a skirt or pants, just like the Pien-fu, but the tunic and the skirt or pants are sewn together to become a one piece garment, like the Chang-pao. The Shen-i style is the most common style worn in China. In today’s society, these styles is made to look like modern dresses from women. Women – Must cover their bodies, especially their chest, the only thing visible should be their hands and their faces. This is where the Hijab comes into play. A hijab is a head covering worn by some Muslim women in public. Men – Must cover up their bodies at least between the navel and knee. Both sexes must wear clothes that are loose to hide their curves. Both sexes must wear clothes that are thick enough to hide the color of their skin and the shape of their body underneath. The overall appearance should show modesty and dignity. Women can’t dress like men and vice versa, both sexes should be proud of who they are and the femininity or masculinity. Men are not allowed to wear gold or silk because they are considered feminine accessories. Muslims believe clothing is meant to cover private areas and be a beautification. Muslims’ clothing must be neat and clean, it can’t be too fancy or ragged. Clothing should not be worn in order to gain admiration or sympathy. Boy and girls are expected to and began to follow and live and by these requirements when they hit puberty. When I think of India I think of its elaborate and colorful clothing. I see women in their beautiful sarees, cholis, and salwar kameezes and men in their sherwanis. Over the past decades the designs, patterns, and even wearing styles of the traditional clothing have changed to keep up with the modern era. Saree/Sari: Even though the saree has evolved over the past years it still remains the most exquisite single piece of garment for Indian women. The saree is a single piece of cloth, measuring to a length of about 4 to 8 meters and a width of about 120 centimeters, which is draped around the entire body. The “undergarments” of a saree include a blouse that shows the stomach and the petticoat (a underskirt). Most of the fabric is then pleated at the waist and then wound around to make a skirt, with the remaining few yards swept across the upper half of the body, covering the left shoulder. The saree is still the most favored garment worn at most formal occasions or at religious ceremonies, Indian women say it represents their dignity. A saree basically defines a woman. The style of wearing a sari reflects the age, region, religion, status, and occupation of a woman to some extent. Cholis: A ghaghra is a full flared ankle length skirt and is worn with a choli, a type of blouse that also usually shows the stomach. A choli is incomplete without a odhni, a scarf that ties the entire outfit together. Salwar Kameez: A lengha is a type of loose trouser/pant that is worn with a salwar kameez, a loose knee-length shirt. This Indian outfit is accompanied by a dupatta, a scarf. Sherwanis: A sherwani is a long knee-length coat that is buttoned up to the collar. It comes with a man’s versions of a lengha and a dupatta. A sherwani adds to the charm and grace of a man. Indian men spend lavishly when buying sherwani suits for special occasions like weddings. Kurta: A kurta is a loose knee-length shirt that can be worn with pants, jeans, or legging, depending on the gender. In the olden days it was mostly worn by men, but today woman wear it too. I have seen the style of kurtas brought into American fashion trends this past spring/summer season.